The two boxes arrived this morning. I had two very excited girls nagging me to let them open their boxes. Natalie, my seven year old and her sister Charlotte (two and a half) both love drawing and painting so these boxes were ideal. The boxes were well packaged and very colourful and quirky. The Grande Box (Charlotte’s) was wrapped in cardboard so only the label “I belong to Charlotte” was showing. Natalie’s box, the Super Box was wrapped up in a clear bag. Both boxes looked lovely and personalised. The Grande Box also had some puzzles on ie colour in the toucan, maze puzzles and drawing spaces. On opening the Super Box, Natalie found four boxes of crafts. 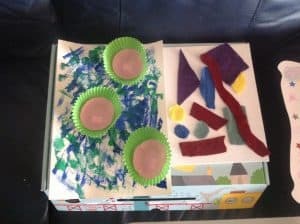 The lid of the box had pictures showing what was to be made and how difficult and messy they each are. Also which skills each project develops ie concentration, motor skills, creativity. There was a card on top detailing what the theme was. This month’s is Artists. Natalie loves art and couldn’t wait to get started. Natalie started with the Alexander Calder sculpture. As a whole she enjoyed building this, but of all the projects this was her least favourite. 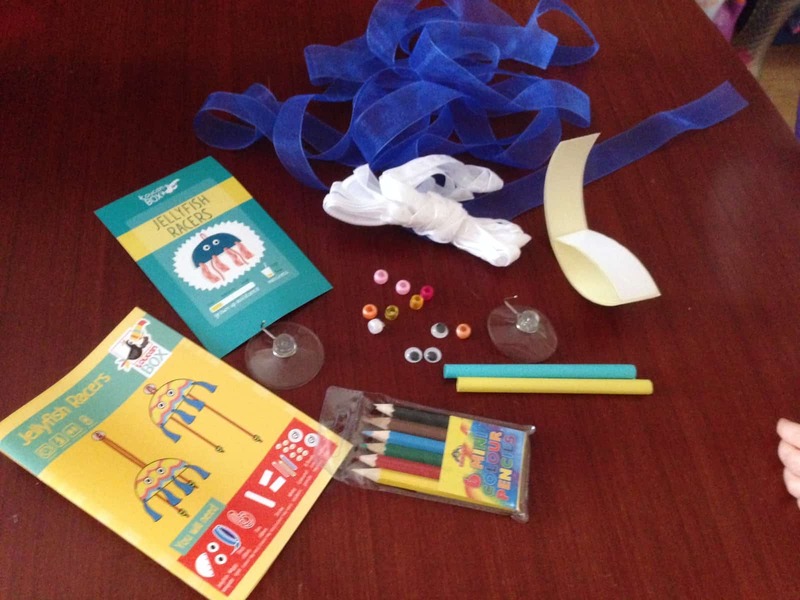 She had a plastic cup, spool, pipe cleaners and sheets of coloured foam in her box. Putting it together was fairly easy for her. She followed the instructions as best she could and didn’t need any help from Mum or Dad at all. The sticky dots used to hold it all together were “useless” however, so we ended up having to use glue in the end. Once complete, Natalie was fairly pleased with the result but the glued on shapes kept falling off, so overall a little disappointed. Van Gough Starry Night – I have to say this was a family favourite. The instructions in the box were straightforward. Natalie cut out house silhouettes and stuck them down. 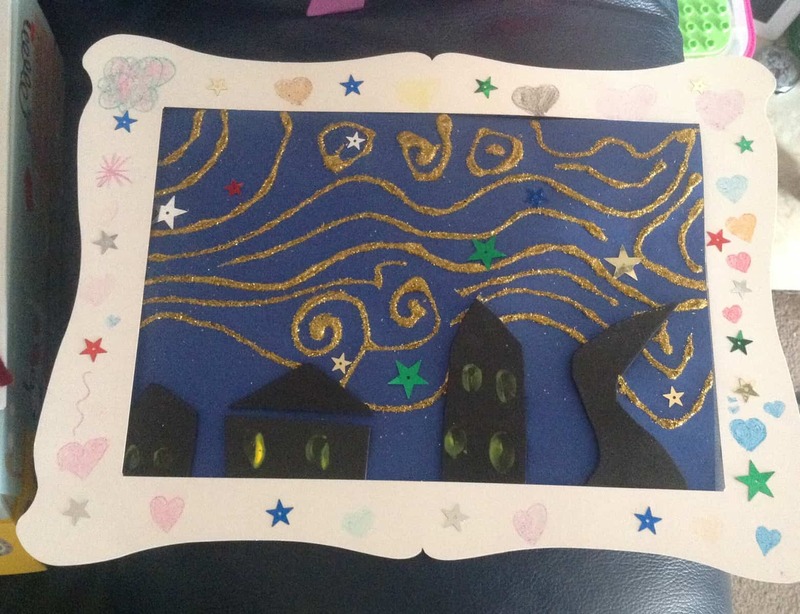 She dipped her finger in yellow paint to create lit windows (her favourite part), then added stars and glue swirls in the sky before sprinkling with glitter. The finished result looked amazing and there was even a frame to put around it. We shall definitely be displaying this artwork. Monet Water Lilies – this was another project where we loved the finished result. 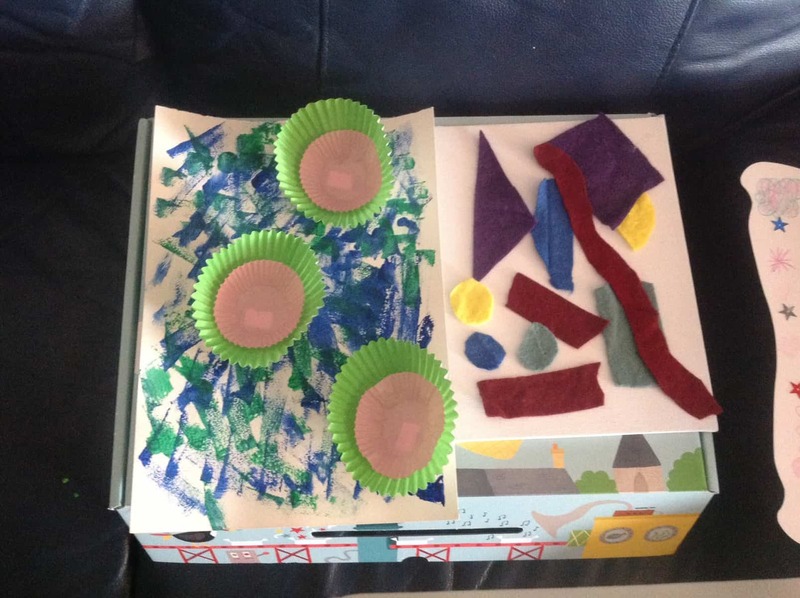 The box contained a sponge brush, blue paint, green paint and some cupcake cases. Natalie had fun sponging on the paint to create a water affect. She also enjoyed sticking down the cupcake cases, and managed all by herself. It created a 3D painting of Monet’s famous Water Lilies. Another painting for the Kitchen Wall Gallery. Lastly, Natalie attempted the Henry Matisse Style Collage. 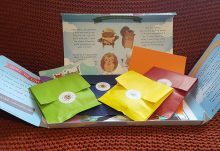 Her box contained coloured felt, white card and school glue. She cut out some shapes from the felt, but needed a little help from Dad with the cutting. Once the shapes were all arranged and glued down, the result was lovely. On opening Charlotte’s Grande Box she found two boxes. 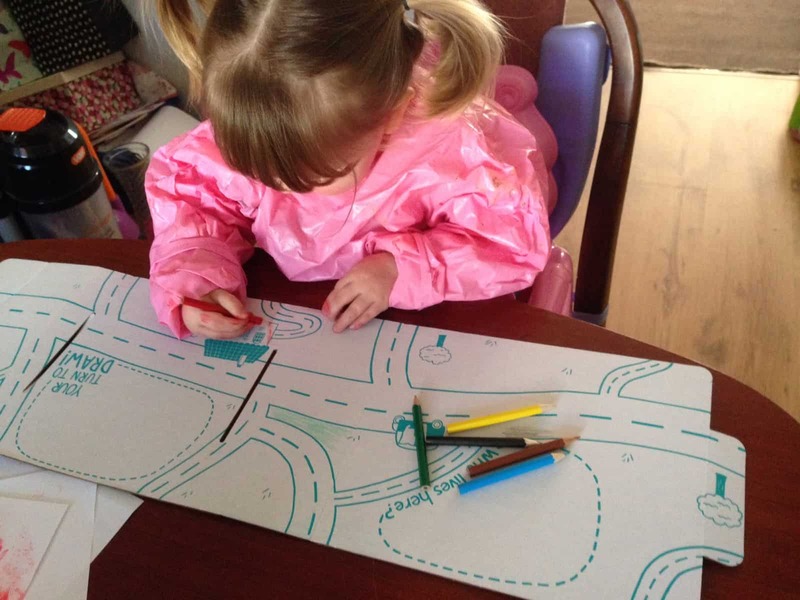 She peeled back the cardboard flap to reveal what she was going to make, her face lit up. As with Natalie’s, the cards displayed how hard each activity was, how much adult help was required and what skills would be developed. Charlotte’s also had a card with the theme on – Ocean. As Charlotte is a little under the 3 years the boxes are recommended for, she needed a little help with her activities. We started with the Racing Jellyfish. The box included some blue ribbon, thin ribbon, beads, straws, googly eyes (she loves these! ), window suckers, colouring pencils, card and sticky tape. The instructions were clear with pictures of each stage. I explained to Charlotte what to do step by step and she managed to follow. She coloured in the jellyfish bodies on her own, stuck down the straws (after I’d cut them in half). I helped cut the ribbon to the length required and thread it through straws before tying. I believe most three year olds would struggle to tie the knots in the ribbon to be honest, so a fair amount of help is required. Once the legs and beads were all on Charlotte stuck on the googly eyes and we were ready to race! We stuck the suckers on our dining room door with window panels. To race you simply pull on one side of the thin ribbon hanging from the jellyfish, and the jellyfish body rises. We had hours of fun racing, Dad and Natalie also got involved too! The Hermit Crabs were a little more complicated but fun to make as a team. 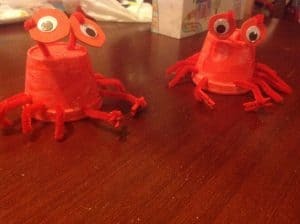 The box contained two polystyrene cups, pipe cleaners, red foam, paint, a paintbrush, googly eyes (woohoo!) and small craft pegs. Charlotte painted the cups no problem. It was the being patient waiting for them to dry she had problems with. Luckily however she had a large cardboard setting with a road and trees to colour in and draw on to keep her occupied. Once dry, Charlotte pierced the pipe cleaners through the cup to make the legs, and with a little help put one through the bottom of the cup for the eyed to go on. I cut circles in the foam, she stuck on the googly eyes and I attached them to the stalks. Charlotte found the pegs a little fiddle to attach, but got there in the end. The finished result was lovely. She’s asked to put them in her room too, so I can safely say the boxes were a big hit. We finished our Craft Day with the reward charts. For each craft project ordered you get a sticker. 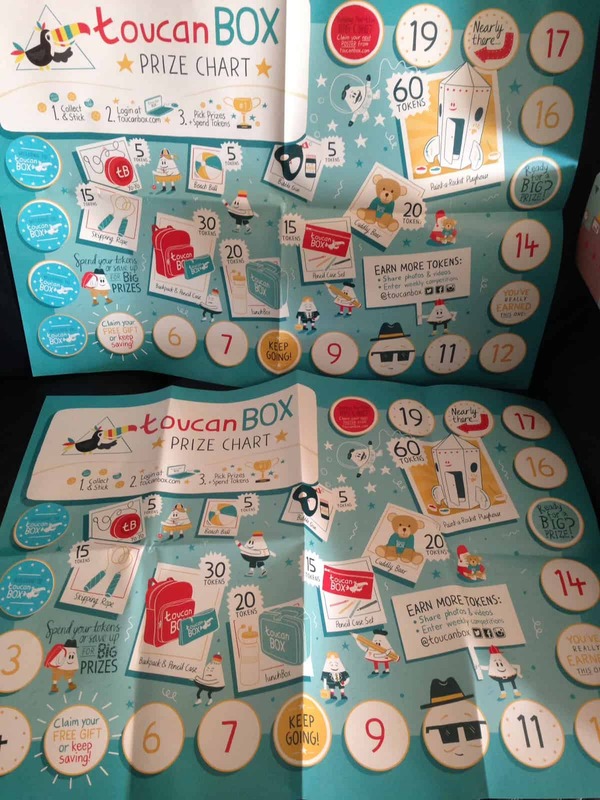 (Natalie had four in her box and Charlotte two) Once you’ve collected five stickers, you can claim a free gift – a yoyo, beach ball or bubble gun. 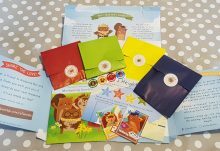 Or you can save your stickers and claim a larger prize ie skipping rope (15 tokens), lunchbox (20 tokens), or paint a rocket playhouse (60 tokens). You can also earn more on their website by entering competitions and sharing photos and videos of your finished artwork. We shall definitely be posting. Natalie loved the projects and the fact that she could do most of them on her own without help. 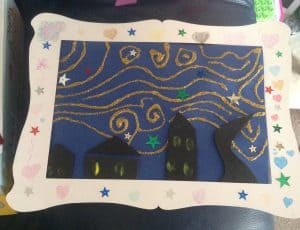 She enjoyed the Starry Night one the most, especially how it turned out and included a frame. The least favoured one was the sculpture. The sticky dots didn’t hold it together at all, and the foam shapes wouldn’t stick to the pipe cleaners which was very frustrating for her. Charlotte loved both of her projects too. The Jellyfish were fun to make and she enjoyed colouring in and sticking on googly eyes. The finished results were fab and entertained the whole family. We also had some family visitors later in the day and they were impressed with both boxes and contents. Our girls enjoyed showing off their artwork too! The Grande box projects took around the same amount of time to make as Natalie’s Super Box, once everything was dry etc. It kept both girls happy though and Natalie even joined in with the puzzles and colouring in the Grande box with Charlotte afterwards. 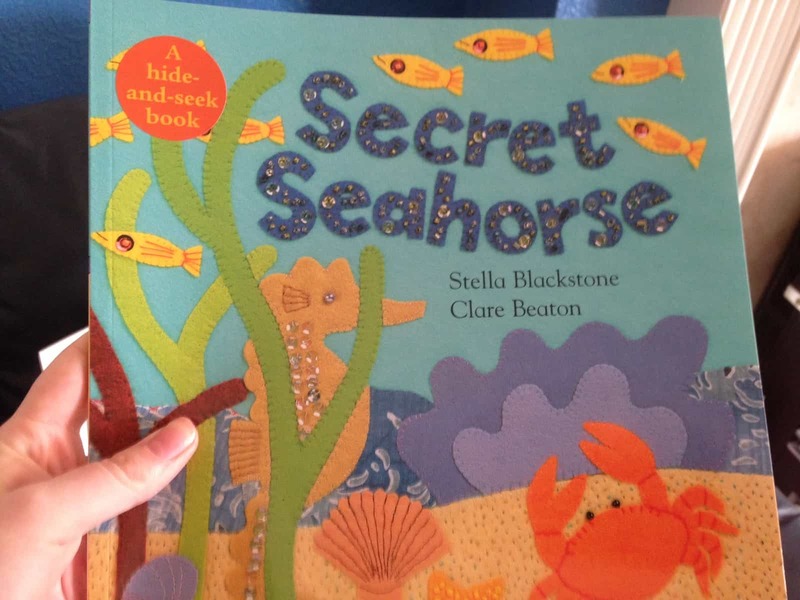 Both of our daughters are looking forward to having the storybook (included in the Grande Box) – Secret Seahorse by Stella Blackstone and Clare Beaton as their bedtime story. 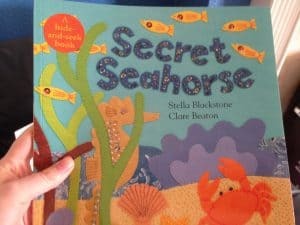 It’s a lovely hide and seem book about a seahorse who meets lots of sea creatures on her travels. The perfect end to a busy day! The instructions were easy to follow with a little guidance and explanation (Natalie believes more is more when it comes to art). They both enjoyed the Craft Day making all of the projects and would love to do more. We also have some glitter, pipe cleaners, and paint left over for future art projects (you get a good amount in the pots unlike other craft sets). The instructions and explore more cards had a little about the artists and ocean creatures featured and some facts. Natalie enjoyed reading about them and reading them to her sister. She has learned a lot more about different art forms and artists and of course, sea life. Definitely an enjoyable experience for both girls. Dad enjoyed it too. His only criticism was that the boxes are a little overpriced for what you get. Especially if you have a large family with two or more children who fit into the age groups. I did notice there is the option to pay a little extra to alter your box and include a little extra for a sibling to help. Something to consider. If they were a couple of pound less he wouldn’t have a problem ordering the two boxes. 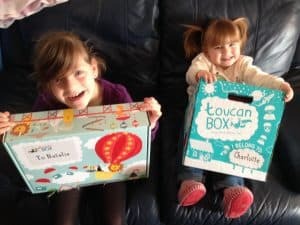 They are fantastic for a monthly treat, some family time and as the boxes are personalised it will bring a smile to any child’s face, having their very own box. 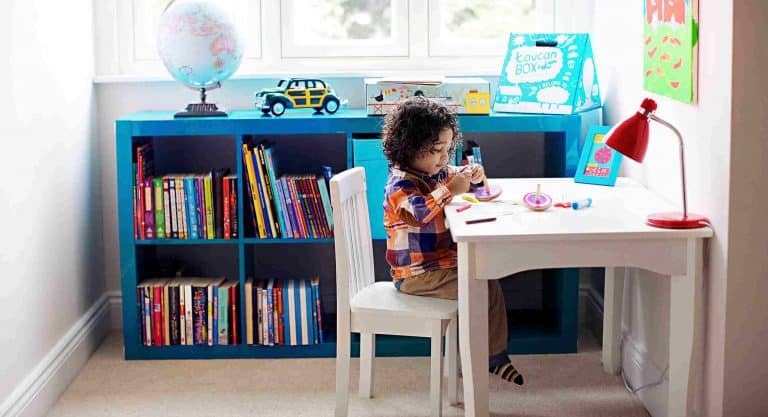 The Super Box is also well made and can be reused to store any precious drawings, paintings your little one creates. Thank you for sending the boxes. Our girls thoroughly enjoyed making the projects and learning new things. We are considering a subscription as a treat to keep them amused, although may order the Grande box and pay the £4.95 extra so Natalie can help her sister and work together. Natalie liked Charlottes box too and asked to help with the Hermit Crabs. 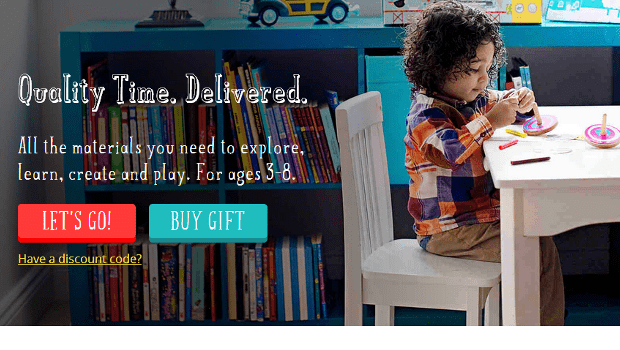 ToucanBox provides families with an inspiring box of arts and crafts to engage, excite and teach children between the ages of 3 and 8. 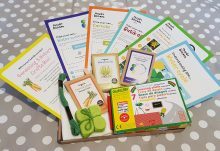 Each month a box of hands-on, educational projects lands at your door, bursting with all the ideas and materials to create four unique crafts, as well as easy-to-follow instructions and a reading book to explore fantastic themes further. Each project is designed by educational experts to stimulate children’s creativity and curiosity, focusing on essential skills to ensure excellent progression in key areas such as concentration, problem solving, hand-eye coordination, numeracy and literacy.With all materials and inspiration included you can finally enjoy quality time, delivered. How would you rate toucanBox ?